All videos are linked to Amazon.com. As a warning, I have put up pictures of the covers to give you somewhat an idea of the style of each video (I know, I know. "Don't judge a book by its cover") so the pages may load slowly. Grover and Anneliese go to Israel! Join your favorite blue monster and his new pal, Anneliese van der Pol, as they begin to explore this beautiful land. It’s an adventure they’ll never forget – full of fun, friends and flying falafel! Guest appearance by Christina Applegate. 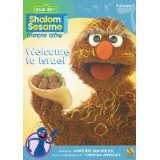 Welcome to Israel is the initial title of a new 12-DVD series "Shalom Sesame", by the creators of the widely beloved educational program Sesame Street. 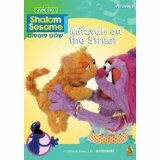 "Shalom Sesame" is meant to introduce viewers to Jewish customs, holidays, traditions, and culture. In Welcome to Israel, furry muppet friends and Anneliese van der Pol explore and learn about the beautiful country of Israel. Though especially ideal for youngsters age 3-8, Welcome to Israel is enjoyable for the whole family, featuring pleasing songs, breathtaking photography, and amazing fun facts. 28 minutes plus 22 minutes extras. 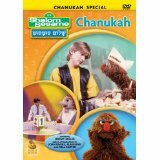 Also highly recommended is volume two of the "Shalom Sesame" series, Chanukah: The Missing Menorah (28 minutes plus 22 minutes extras). It’s time to celebrate Chanukah in Israel! 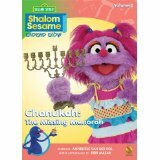 Grover’s bringing the latkes and all is well until Anneliese gets caught in a game of tag with a chicken and loses her special menorah … just as Chanukah is about to begin! Can her friends find the missing menorah in time? Guest appearance by Debi Mazar. Grover can’t seem to figure out why everyone is so busy just before a day of rest. 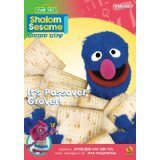 Join Grover as he learns all about Shabbat, and sing along to Avigail’s favorite Shabbat song. Bim Bam! Featuring a guest appearance by Cedric the Entertainer. 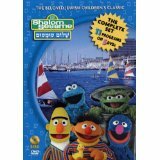 The Shalom Sesame educational series of DVDs, in which the beloved muppets of Sesame Street meet new friends and celebrities from Israel and teach viewers about Jewish holidays, traditions, and culture, continues with three new installments. 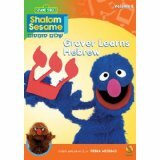 In volume 3, "Shabbat Shalom, Grover!" (28 min.) 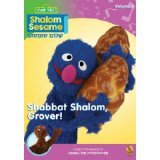 Grover learns all about Shabbat, the "time out" of the Jewish week meant for rest and reconnecting with family. In volume 4, "Grover Plants a Tree" (27 min.) 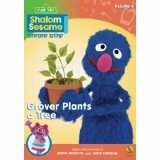 Grover learns about Tu Bishvat, a holiday that celebrates trees, and takes part in planting trees to help improve the quality of the air and add more greenery to the world. In volume 5, "Mitzvah on the Street" (33 min. ), viewers learn about the value of doing good deeds and helping those who need it most, when a storm's trail of destruction leaves a lot of cleanup to be done. Then Grover is invited to a Bar Mitzvah in Jerusalem and discovers more about the purpose of this celebration marking a crucial transition in a young person's life. 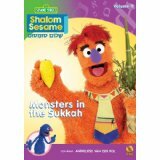 Intended for young viewers ages 3-8, The Shalom Sesame series is an excellent educational tool and highly recommended. It’s Tu Bishvat! Grover, Brosh and Avigail get back to nature as they learn how to plant trees and make the world a better place. Featuring guest appearances by Debra Messing and Greg Kinnear. Everyone’s dressing up for Purim, so get out your groggers and join the fun! Avigail is inspired by the story of Esther. Moishe Oofnik is his usual grouchy self…but who is that mysterious masked singer at the Purim Spiel? Featuring Anneliese van der Pol and a guest appearance by Eva Longoria. It’s almost time to celebrate Passover, and there is no horseradish to be found. 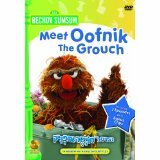 Grover, Anneliese and Avigail put their heads together to track it down, but things get tricky when there is an Oofnik involved! Featruing Anneliese van der Pol and a guest appearance by Jake Gyllenhaal. Rechov Sumsum (Israeli Sesame Street). In Hebrew with English subtitles. Join your favorite Sesame Street characters, Bert and Ernie, Grover, Cookie Monster and others, on an exciting tour of Israel. Created by Children's Television Workshop and Jim Henson Productions for Israeli television, this series will delight in both English and in Hebrew. Itzhak Perlman, Bonnie Franklin, and Mary Tyler Moore join Arik and Benz and the rest of the Sesame Street gang as they explore the land of Israel. Some segments contain Hebrew presented in an easy-to-understand format. Arik and Benz explore Tel Aviv's coast and the Carmel Market. They search for ice cream and watch soccer players. Arik and Benz along with Itzhak Perlman and Bonnie Franklin explore several kibbutzim across Israel. Included in this program is a discussion of kibbutz foods and lifestyles. Benz and Arik explore Israel's diverse population. Segments about Jewish children from around the world, Sephardic Jews and Druze highlight this tape. The Rechov Sumsum gang explores the Knesset, the Israel Museum, and the Western Wall. Experience the golden beauty of Israel's City of Peace as Itzhak Perlman, Bonnie Franklin and their young Israeli friends take you on a tour of Jerusalem from the Old City to the holy places of the Christian, Moslem, Armenian and Jewish Quarters. Bert, Ernie, Grover, Cookie Monster, and other "Sesame Street" favorites are off on a magical tour of Israel. Your child will thrill to the sounds of their favorite pals talking in Hebrew and English, while host Jeremy Miller recalls the story of the Maccabees and the long, hallowed tradition behind the Festival of Lights. This program focuses on Chanukah: the main stories, symbols and traditions associated with this holiday. Shalom Sesame's new guest host, Jeremy Miller, learns about "oofganiot" and how fried foods symbolize the oil that burned in the Temple for eight days. Travel through the year learning about holidays and singing with our Sesame Street pals. The oofnik gourmet shares a recipe for a slimy Rosh Hashanah treat- apples and sardine grease- but Jeremy explains that we dip apples in honey for a sweet new year. Travel to exotic places in Israel to discover beautiful beaches, enchanting underground caves of Bet Guvrim, and secret passageways behind the Western Wall. Sponsored by the letters tzadi and mem, the program includes a music video "Disco Tzefarde'im," the Disco Frogs. When all the letters on Israel's Sesame Street disappear, Jerry Stiller and porcupine Kippi ben Kippod host a telethon to try to raise all 22 letters of the Herew aleph-bet. Includes appearances by Joan Rivers, Nell Carter, and Itzhak Perlman. Presents the story of "Jerusalem Jones and the Lost Afikoman," as well as a skit on the invention of matzah with comedienne Anne Meara. Stars Sarah Jessica Parker, Alan King, and Mary Tyler Moore. In this glorious finale, Kippi, Sarah Jessica Parker and the children of Israel host a rousing mixture of traditional Israeli and Hebrew songs with the best loved Sesame Street tunes. 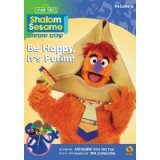 Includes many favorite Sesame Street songs in Hebrew and English. Also stars blues singer B.B. King and musician Paul Shaffer.